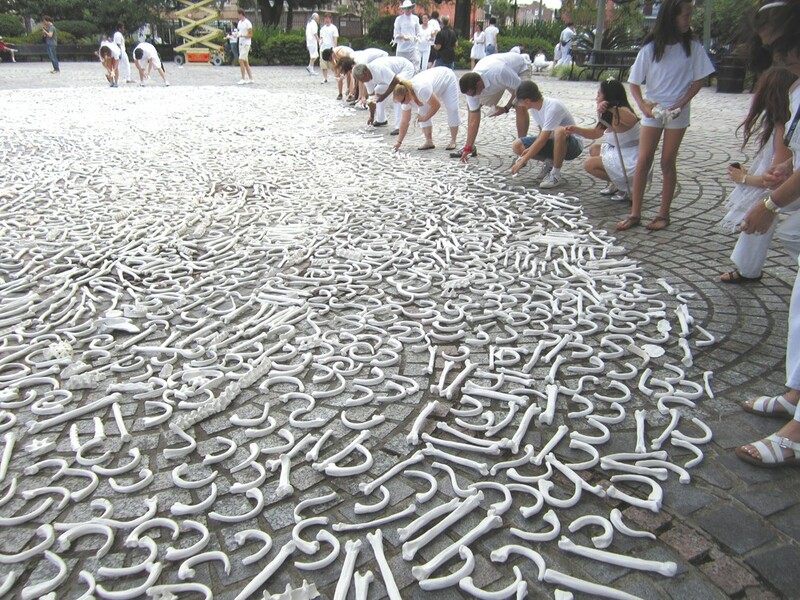 Artists arrange thousands of “bones,” a symbol of those killed in international conflicts. The bones aren’t real — though they easily could be. The thousands of ribs, spines, femurs, ulnas, tibias, skulls and other skeletal pieces — made of clay or other materials — represent the countless victims of genocide and civil and religious wars happening around the world today. The faux remains will cover most of the floor. One Million Bones, an Albuquerque-based, nonprofit social art project founded in 2009, is the group behind the traveling exhibit. Thousands of the bones in the organization’s growing collection are traveling to Spokane as part of a larger effort to bring a million handmade bones — crafted by artists, students and other contributors around the U.S. — to a mass grave installation on the National Mall in Washington, D.C. The concluding DC installation planned for April 2013 is intended to serve as a conscious, visual reminder of the victims and survivors of violence in places like Somalia, the Democratic Republic of Congo, Sudan, Burma and the Middle East. Organizers also hope that the massive collection of handmade bones will prompt U.S. leaders to take a more proactive stance to end the violence and help those nations heal. Whitworth assistant art professor Katie Creyts says students at the university have made more than 100 bones to be included in Sunday’s exhibit and that eventually will go on to D.C.
Students in Creyts’s Community Arts in Practice class hosted an on-campus bone-making event, and also led a workshop at a branch of the Boys & Girls Clubs of Spokane County during which about 100 more bones were made. Creyts says she got her students involved in the art project after she was contacted by Abbey Cook, a Washington state representative for One Million Bones. This Sunday, Creyts says visitors to the free, one-day exhibit will meander through two rooms full of the bones, with pathways winding through the installation outlined along the floor by the bones. “The Saranac Arts Project is a great space for the installation because its dark wood floor and brick walls will create contrast with the white bones,” she says. Creyts says she hopes One Million Bones’ stop in Spokane will raise local awareness about the ongoing humanitarian crises around the world through the organization’s use of social art. Along with the exhibit’s main focus urging others to activism, One Million Bones has partnered with a foundation to raise $1, up to $500,000, for every bone that’s made. The funds will be donated to CARE International, a group that’s working on the ground in Somalia and the Congo to help those affected by the violence. Mini-installations of the handmade bones will continue to be hosted in cities across the U.S., leading up to the final display in the spring. For those interested in finding out how to get involved in One Million Bones’ mission, its website includes links to donate directly, or have a bone made in your name.